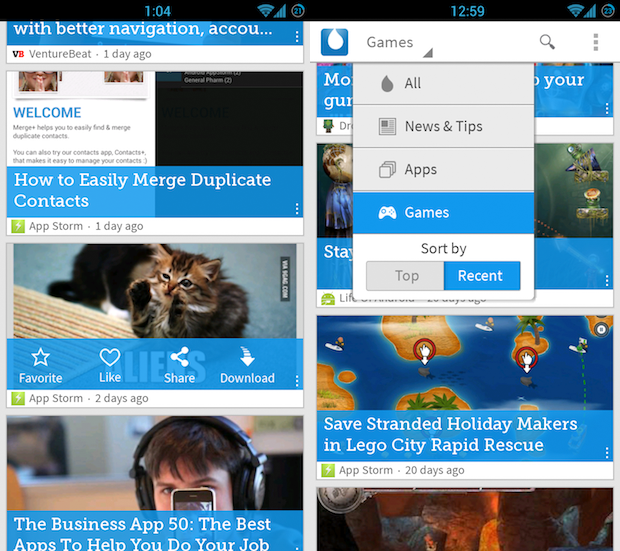 Drippler is a smart app that finds articles and content based around what device you have and what you like. Unlike some other apps Drippler content is from around the Internet, but only tips, tricks, apps, and articles you care about. And delivers all of these to your device for you to read. The experience is not the same for every person and is even different from phone to tablet. Drippler is a very popular app and for good reason as it makes it easy for anyone to get specific articles about the phone or tablet all in one app. The app has over 5 million downloads on the Play store and millions of users on iOS. 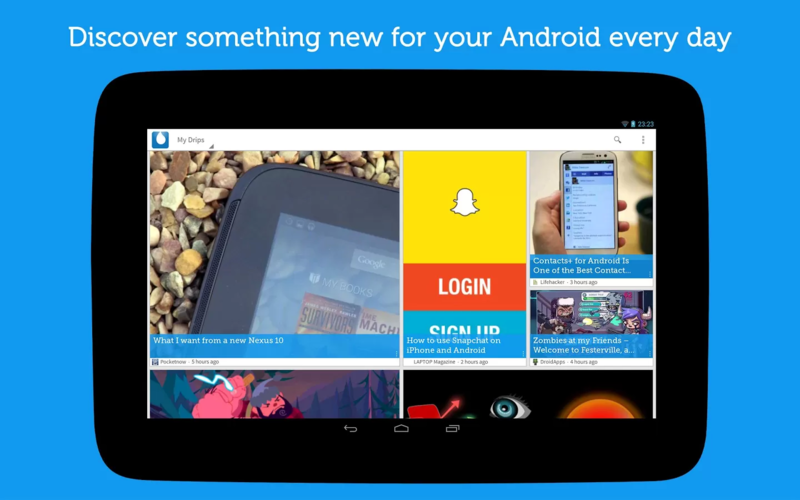 Once you install Drippler on your phone or tablet the app will detect what device you have and this includes the device and the OS version like Android KitKat or iOS 8 and add these to the filters used to gather content. You can then choose to get articles about games for your device. You are then taken to the My Drips page which shows all the content that fits your specific device and interest.The device-specific articles, tricks, accessory reviews and how-to’s are called “drips” by the app. Because they are targeted specifically at your device, these nuggets of information are personalized and useful. The app makes it easy to share each drip with others and has settings to determine how often Drippler should be checking the web for more drips. Drippler calls the articles it serves you drips and the app includes an very good looking widget and a built in notification every day at 6:00 PM with a new drip. You can of course turn off the notification if you hate app notifications. If you find an article you like on drippler you can favorite it or add it to your bookmarks to save the article for later. You can also share the drip to your favorite social network from the app. A recent update to the app has brought something new to the app, drippler now has discussions in the app. Discussions is pretty much a forum that users can use to talk about apps, devices, tips and several other topics. Discussions is a nice added feature for the Drippler app where you can search for advice or support and discuss your thoughts about apps, devices, or accessories. If want to get news about your device, apps, or services Drippler is a great app and has a very good looking widget for your homescreen that allows you to flip through the latest drips. You can download the app from the Play Store on Android or the App Store on iOS. So check out the app if you like reading news articles about your device and apps.